Vision is our most dominant sense. The hegemony of sight in architecture is a given. “In Western design culture, sight has historically been regarded as the noblest of the senses," states renowned Finnish architect Juhani Pallasmaa . Consequently, our preference for sight often leads to architectural imbalances. This is exemplified in contemporary design choices such as pastiches to Brutalism (i.e., exposed concrete soffit and bare walls). These design trends can often lead to unwanted examples of acoustic phenomena. 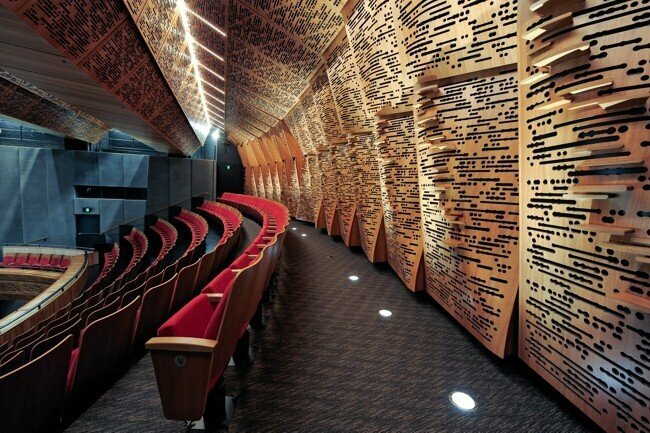 However, acoustic phenomena can be awe-inspiring and magical in other design settings. Amazing demonstrations of acoustical prowess exist throughout history, in both mind-boggling and magnificent displays of ingenuity. Occasionally, the creation of a brilliant auditory space is the result of serendipity, a wonderfully unexpected by-product of the physical design. And in some instances, a space becomes iconic solely for its acoustic properties. This five-article series will celebrate amazing acoustic phenomena and observe the relationships to everyday architecture. It is intended to provoke discussion about inspiring interiors, provide a learning experience and to bring together those who are affected by acoustics. Sometimes great visual architecture can lead to not so great acoustics. It’s fair enough. The subject of acoustics is an enigma to most. It doesn’t help that acoustics are (mostly) invisible. Acoustics also exist in contrast to architecture, in that it is often more of a science than an art. Chalk and cheese so to speak? Regardless, there are frequent discrepancies in architectural composition that do not factor in the impact on the auditory environment - the end result being an unsuccessful project. This can lead to costly and inefficient redesign practices that can also impact the original design aesthetic. The importance of acoustic comfort is widely discussed. We know that poor acoustics can have a dramatic effect on productivity, mood, health and the enjoyment of being in a space. Every space is unique with its own variety of challenges. Acoustics is a complex science which warrants its own field. It is likely that without specialist attention and not knowing the acoustical requirements of your space, poor acoustic comfort will follow. Knowing the acoustical requirements of your space will increase the quality of your project! Good acoustic consultants know how to work with you to achieve the overall architectural vision. Whispering walls and galleries are the acoustical product of hard surfaced concave architecture. The name is given due to whispered communication being heard with incredible clarity over unexpected distances. This phenomenon can be described as magical, as the experience appears to break the laws of physics. In actuality, sound waves are being reflected around the circumference of the arc. Imagine that the unimpeded sound waves of a whisper travel directionally in a straight line. When they interact with the arc, multiple reflection points (in procession) can be created. The sound is then able to hug the curvature of the structure and travel great distances to its destination. Given the requirement of the curvature, the effect works best whispering along the wall, not perpendicular. The Barossa Reservoir is a unique attraction that is popular among children and draws tourists because of its acoustical properties . 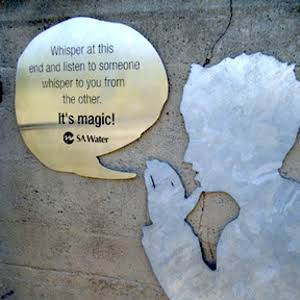 It is stated on the Barossa Australia website that “words whispered at one side can be clearly heard at the other, more than 100 metres away” . Other sources state that a conversation can be held from over 140 metres away , . The world contains many whispering galleries, and most have not been intentionally designed. 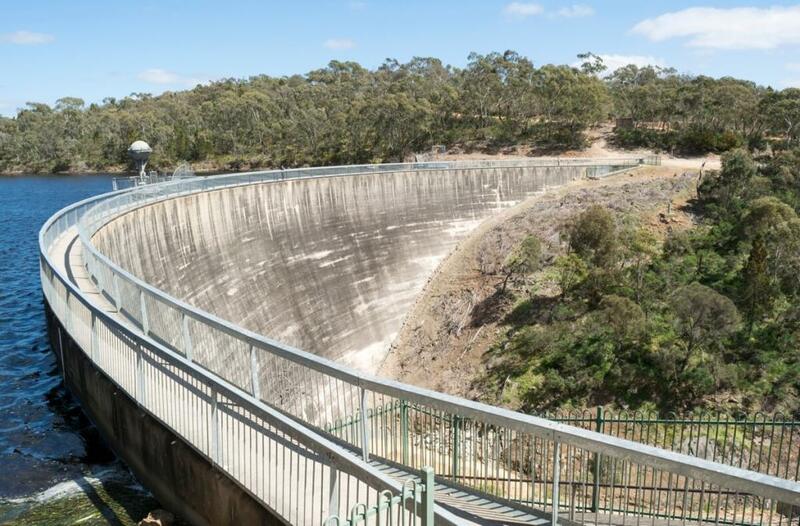 As enchanting as the acoustics are at the Barossa Reservoir, the design is of a typical ‘arch dam’ that implements the curve for engineering purposes. Other whispering galleries around the world have also proved serendipitous. In a report by The New York Times, an architect who worked on the restoration of Manhattan’s Grand Central Terminal admits that the train station’s whispering wall is a “happy coincidence” . Concave surfaces in architectural design are definitely amazing and look great. Studies show the advantages of curves in architecture in relation to human perception. A Harvard Medical School study found that “we prefer curves because they signal lack of threat (i.e., safety)” . Further studies indicate that we associate curves with beauty and that this is hard wired into our brains. Neuroscientists at the University of Toronto conducted a study where they were able to determine that “participants are more likely to judge curvilinear than rectangle spaces as beautiful” . 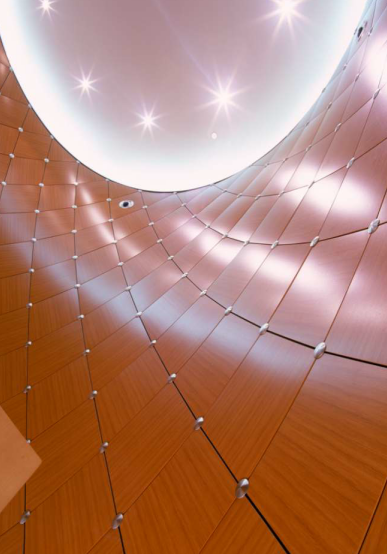 While aesthetically pleasing, curved designs can haunt the minds of acousticians. Avert your eyes my friends! An issue with this design is that focussing effects are inherent to many concave surfaces. Focussing is the build-up of sound energy in localized regions of a room. As opposed to whispering along the arc, focussing occurs when the source and listener are further away from the focal point of the arc. This is bad when conducting acoustic design for speech, especially when the acoustic design goal is to have an even response across all parameters. It is particularly prominent and common in the design of domed structures and circular walls. Many studies exist pertaining to controlling acoustics in circular rooms. At the 2018 Australian Acoustical Society conference in Adelaide, I witnessed @Matthew Ottley from Marshall Day Acoustics present “Designing for Speech in a Circular Room” . The paper deals with circular architecture and successfully manages unacceptable speech intelligibility issues after the fact. The refit was designed in collaboration with the architect and was able to achieve a circular aesthetic with significant improvements to the acoustics. Providing absorptive surfaces to the arc can attenuate the reflection and reduce the effect of focussing (see pictures below). This can be achieved in the initial design stage with curved acoustic panels, walls and ceilings. This method will remove sound energy from the room and result in a lower reverberation time. 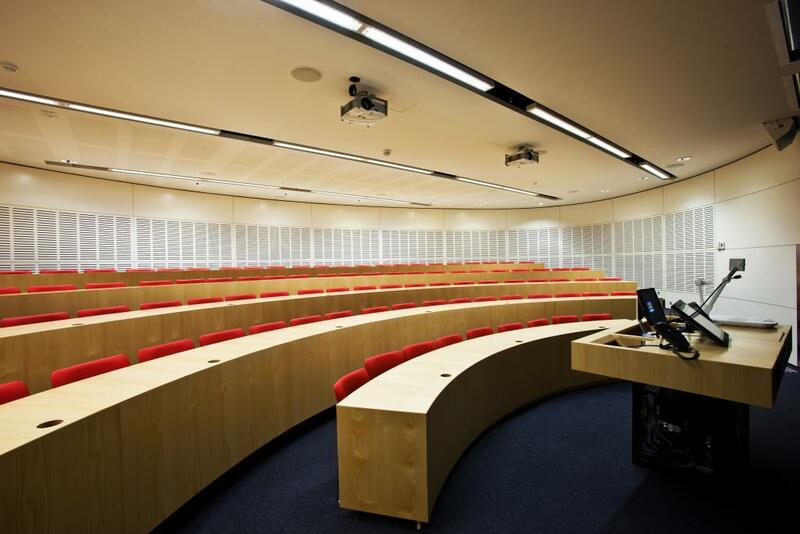 Curved absorptive acoustic wall panels in a lecture theatre at the Faculty of Law, Uni of Sydney NSW. 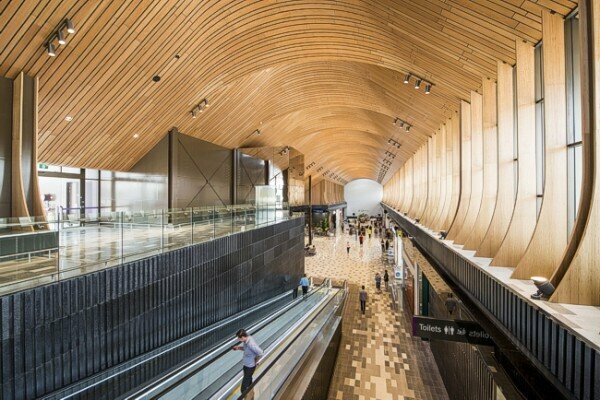 Complex curved absorptive slatted ceiling in the Market Hall at Robina Shopping Centre. Robina QLD. Creative music score theme patterned acoustic wall and ceiling panels address a demanding acoustic specification at The Glasshouse Port Macquarie, NSW. Perforated acoustic panels achieve a decorative curved ceiling above a reception desk while addressing noise control. If the sound energy is to remain in the room, diffusion can be used. 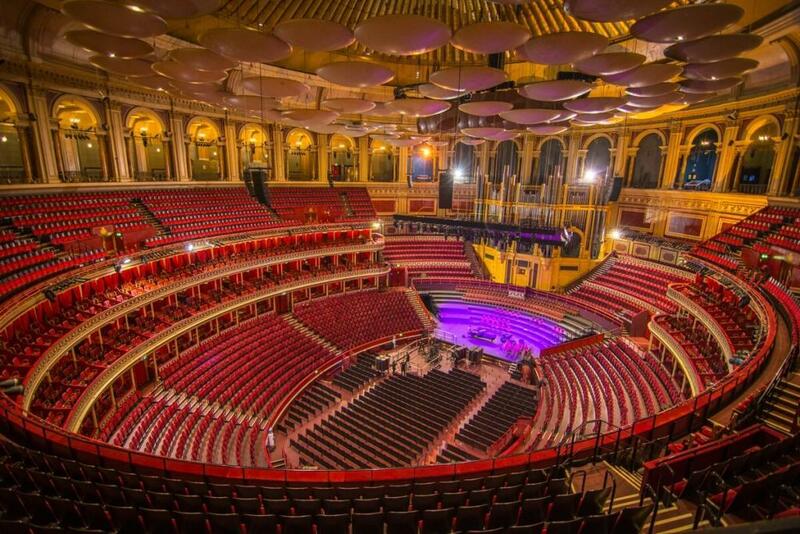 An example of this is the Royal Albert Hall which "used to suffer from an unfortunate echo caused by the cove of its ceiling"  See the "mushrooms" located at ceiling. For those who are not aware - diffusion is a concept that evenly scatters sound within a space. Curved wall made up of segmented panels. The geometry of the space can also be altered to manage the focal point. Problems can be avoided if the focal point of the arc is not relative to the sound source and listening areas. Additionally, the arc itself can also be designed to scatter sound rather than focus. These options do however require careful calculations and predictions from your acoustic consultant. Whispering walls are an amazing example of how a space can be understood and appreciated through its acoustical properties as much as through its aesthetic design. It also gives an opportunity to demonstrate how not considering all elements in the design stage could have ramifications on the function of a space. It is never ideal to treat acoustic considerations after the fact. The result can be inefficient, costly and potentially impact the original design aesthetic. There are many strategies to manage focussing effects. There are also causes of focussing other than concave surfaces! Remember to speak with your acoustic consultant when designing any room for communication. Michael Phillips is an acoustic engineer who specialises in engineering acoustic treatments for both aesthetic and acoustic design requirements. Creator of bespoke treatments including; diffusion and absorption, wall and ceiling systems, curved beams and panels. For more information on acoustic solutions, email Michael at [email protected] or phone him on 61+ 02 6333 8014. Juhani Pallasmaa, the Eyes of The Skin – Architecture and the Senses, Part 1 - Page 15, 1996. Barossa Australia, Whispering Wall, accessed 8th January, 2019, https://www.barossa.com/related/56b26e252cbcbe7073ae68c1/_Whispering-Wall.